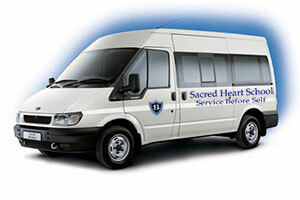 We have two minibuses which are owned and run by the school. Currently, the minibuses cover both the King’s Lynn and Downham Market areas. If you are interested in using this service please Contact the School Office for details of the pick up points. Angie or Gloria will be happy to help you. In cases of need there is a facility for Early Morning Care but an arrangement must be agreed with the school. Pupils arriving by car should enter the school through the gate at the back, by the field from Sporle Road (see map below). Please treat Sporle Road as a one way system so that pupils can disembark on the pavement adjacent to the school. Please Note: We strongly advise parents to use the route shown below to help with traffic congestion. We ask you to treat this route as a one way system via New Sporle Road for dropping off and picking up your children from the back gate of the school on Sporle Road. Visitors are free to park at the front of the school, but we ask that parents please follow the map below. Sat Nav users can use the Community Hospitals postcode of PE37 7HL to locate the back entrance of the school. Please inform the class teacher, in writing (in emergency, by phone) of any changes to ‘going home’ arrangements. It is important for the class teacher to know who is collecting the child. Verbal advice from a child can not be accepted. Pupils are not left to await collection at the back gate; but are taken back to the Boarding House and signed in. They must be signed out when collected. Pupils arriving before 8.15am must be dropped off at the front of the school as the school gates are locked until 8.15am. The police have stated that the pupils must not be dropped off at the front of the school because Mangate Street is a dangerous road. For school events it may be wise to park in the Market Place and walk down to the school. Older pupils may walk down from the Market Place, or up from the opposite direction, each day.